Darwin International Airport (DIA) in Australia’s Northern Territory is the region’s largest airport and the 10th busiest airport in Australia. Serving in excess of two million passengers every year, DIA also shares its runways with the Royal Australian Air Force’s RAAF Base Darwin. A $60 million expansion approved for DIA will double the amount of passengers and planes it can handle and will help reinforce DIA’s reputation as an international transit point between Europe, Asia and Australia. 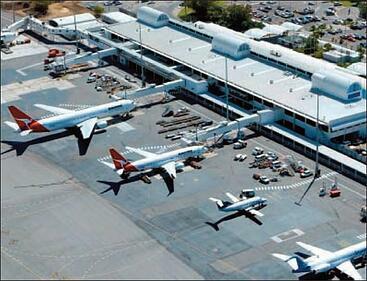 The airport terminal currently services both international and domestic flights with separate cargo handling facilities. an automated, more secure system was installed featuring a Morse Watchmans KeyWatcher® key control system and a new access control security system with electronic locks and programmable keys. The deployment of the new access control and key management system involved replacing all conventional door lock cylinders with a Cyberlock access control system; installing USB-connected key authorizers; implementing back of house management control software and servers; and integrating the Morse Watchmans KeyWatcher key cabinet with the Cyberlock system. An additional undertaking was required to enable wireless capability for the access control system at remote locations on the airport property. Morse Watchmans KeyPro software and KeyWatcher’s email notifications are utilized to send alarms and transaction data to the access control system. In total, more than 180 new electronic keys became part of the system. When not in use or permanently allocated, they are secured in the KeyWatcher cabinet. 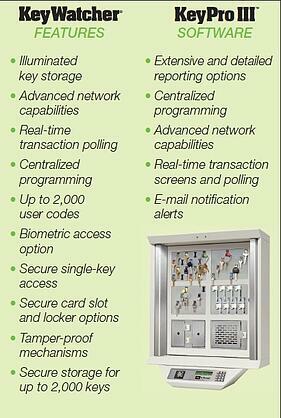 The automated key cabinet allows access only to pre-authorized users and all key access activity is automatically recorded for tracking purposes. Designed for convenience as well as security, the electronic key control system makes it easy for users to access or return keys with illuminated key slots and return anywhere features. 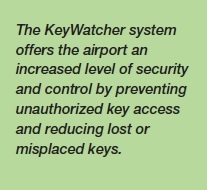 The KeyWatcher system offers the airport an increased level of security and control by preventing unauthorized key access and reducing lost or misplaced keys. In this way, employees or temporary users such as contractors who have reason to be on the premises and are preapproved in the system can access a key from the cabinet without having to sign in or require the presence of security or management personnel. Once a key is removed from the cabinet, in order to activate it the user must update the access control rights for the key at a USB-connected authorizer. When the key is returned, it must first be presented to the key authorizer to extract the audit trail showing which locks the key had touched prior to replacing it in the key cabinet. The KeyWatcher automatically records the access history of each key, including user, date and time of key access/return. Reports can be generated as needed and the cabinet’s built-in RS-232 communication ports allow ease of use for direct connectivity to printers or other devices, or networked connectivity via Ethernet. By controlling access to the keys and knowing when they were accessed and by whom, DIA has enhanced their investment in the access control system with an added level of security.